We previously discussed how owning an original fine art painting, doesn’t provide the same level of ownership as other physical items. In particular, we examined the actions of our hypothetical Executive and how his various uses of an oil painting may have violated the right of the artist. The Executive, with his lack of understanding of basic copyright law, used or transferred rights he did not have. In this article, we’ll look at our other characters, a photographer, a real estate brokerage, and freelance graphic designers, and their various ownership rights for commercial art. Impressed with the photographer’s work, the executive commissions her to shoot his home. A couple of years later, the executive puts the home on the market and gives the photos to his real estate agent to use in the listing. The agent’s brokerage posts the photos on its site and also upload them to a Multiple Listing Service. The brokerage is in the midst of a branding redesign including a new website. The company hires several freelancers to create new designs, including some amazing drawings of streets in the area, which the company uses, along with photos of the executive’s home on its homepage. The Brokerage also makes large posters of the drawings that it sells on its website. Before we turn to our analysis, let’s refresh ourselves on the exclusive rights granted to creators via the U.S Copyright Act. When we left our Executive, a major fashion magazine had used his house for a photo shoot and may have violated an artists copyright by showing his painting in the background of photos that the magazine published in its latest issue. After the shoot, the Executive commissions the fashion photographer to shoot his home. Two years later, he gives the photos to a real estate brokerage hired to sell the home. We don’t know if the agreement between the Executive and the photographer included these requirements, but it isn’t likely. In most cases where the hiring party is not one that regularly hires photographers, the photographer will usually be the one that provides the agreement. The photographer wouldn’t use an agreement that transfers his or her rights to the hiring party. However, if the savvy Executive did provide an agreement containing the appropriate Work Made for Hire language, the work must still fit into one of the nine categories. Photographers rarely take a single photo, so the series of photos are generally considered a compilation. That may not be true of other arts. For example, a fine-art piece would only fall under the work for hire scheme if it were made as part of a compilation. Standing on its own, it is not a work for hire, so the copyright is retained by the artist. In our case, the Executive and photographer probably didn’t sign a Work Made for Hire agreement, so unless the agreement specified the work to be used in a way that included giving them to the brokerage to use, then the Executive and the brokerage are infringers. In the next scenario, the brokerage uses a mix of internal employees and freelance graphic designers to create new logo designs and some original drawings for their website and ad campaign. The prior scenario plays out the same way for the freelancers here. Any artwork the freelancers create can only be used for the purposes outlined in the contract. However, when it comes to artwork or photos used for branding purposes, it is best for the hiring party to have all the exclusive rights forever. No company wants interference with their branding, which under certain circumstances, could happen, although rare. For example, an artist creates a logo for your mall company and charges very little due to the company’s financial status. Assume the company grows into a major entity with a well-recognized logo that it emblazons on millions of T-shirts and other merchandise? Don’t be surprised if the creator claims copyright infringement, saying that the agreement did not contemplate a national rollout and the artist, for this reason, is owed additional licensing fees. And you can bet that there is a lawyer who would take that case on contingency given the potential for a large damages award. Even if the case were weak, the designer might still receive a quick settlement just so to “go away.” So it’s best for the company to use a Work Made for Hire agreement when employing the freelancers, although be sure the materials fit one of the nine categories. What if the brokerage failed to make a Work for Hire agreement and years later wanted full ownership rights to the work. Copyright transfers can be done at any time. 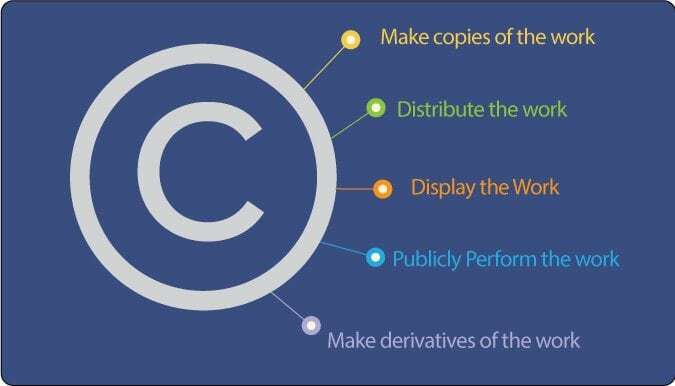 Below is a sample Assignment of Copyright Agreement. Note, each artistic work should be listed as part of the assignment and a high-resolution color version of each work attached to the document, with each initialed by the copyright holder. [Copyright Holder] does hereby sell, assign, and transfer to [Hiring Company], its successors and assigns, the entire right, title and interest in and to the copyright in the Work and any registrations and copyright applications relating thereto and any renewals and extensions thereof, and in and to all works based upon, derived from, or incorporating the Work, and in and to all income, royalties, damages, claims and payments now or hereafter due or payable with respect thereto, and in and to all causes of action, either in law or in equity for past, present, or future infringement based on the copyrights, and in and to all rights corresponding to the foregoing throughout the world. [Copyright Holder] agrees to execute all papers and to perform such other proper acts as [Hiring Company] may deem necessary to secure for [Hiring Company] or its designee the rights herein assigned. IN WITNESS WHEREOF, the parties have executed this Agreement, effective this _____ day of __________________________ , 20___ . How long has there been an employer / employee relationship? Does the employer have the right to assign projects to the employee without consultation? In our scenario, hiring freelancers for a one-time job that is being completed off-premises, for a specified price clearly makes the freelancers independent contractors. A graphic designer who works on-premises and gets paid a regular salary and benefits is likely an employee. So our scenario is fairly clear. However, it’s common for graphic designers to sign onto lengthy projects, working at the hiring party’s offices, and are paid on a schedule that conforms to the rest of the organization. Under those circumstances, enough of the requirements for employee status may be met, making the employer the copyright holder. Hopefully, with all that we have discussed, our last scenario should be easy. The unused drawings created by the freelancers are sold on the Company’s website. So, without an Assignment of Copyright, a Work Made for Hire agreement, or some other legal instrument that allows the company to sell the drawings, the copyright remains with the freelancers who created them. Since selling drawings on the company website has no relationship to the original purpose for creating the drawings, the company is violating the freelancer’s exclusive rights. The moral of the story is that buying art, whether fine art or commercial graphic design, does not always mean that the purchaser fully owns the work. Instead, the purchase is nothing more than a limited license with terms dictated by the copyright holder. Should a purchaser need additional rights, consider one of the various methods discussed here. In either case, the only way to truly know what is really being purchased is to create an agreement which specifies the scope and breadth of the rights transfer, in sufficient detail, so that both the creator and buyer know what is being bought and sold.